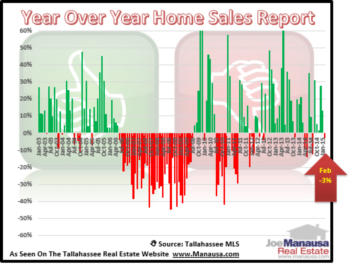 The number of homes sold in Tallahassee through May is much better than what we have seen in recent years, but still far lower than the level Tallahassee would record were it not in a real estate market recovery stage. Low mortgage interest rates continues to bring new buyers to the market, but many existing homeowners who would like to sell and buy still feel trapped in their homes as current values remain much lower than the levels seen during the peak of the housing market from 2004 through 2006. Our report covers historic home sales in order to create perspective for the current level of activity in the Tallahassee real estate market. The number of homes sold through May is at the highest level since 2007, and is consistent with all but the final two years of the 1990s. The graph below shows the number of closed home sales recorded in Leon County, Florida from January through May for each year from 1991 through 2015. It is likely that we will see a few more sales added to the 2015 total in the coming weeks as not all sales have been recorded and posted by the County. Another way we like to analyze history home sales levels is to compare the current month (remember, May 2015 is incomplete as of this writing) with the corresponding month from a year prior. We refer to this as a year over year home sales evaluation. The following graph shows that year over year home sales have been mostly positive for the past three years. The positive reports each month show that the general trend in the market has been growth, something sorely needed after seeing 39 consecutive months of losses that were posted from 2007 through 2009. The 10,000 most recent homes sold in Tallahassee are shown in the table below. For more specific reports on home sales going back to 1991, simply check out any of our recent housing reports on Tallahassee neighborhoods. I hope you have enjoyed our Year over Year Home Sales Report and Year To Date Report for May 2015. If you have any observations you would like to add, please leave a comment in the comment box below.